The Cowboy Birder: What's a cowboys favourite relish? I couldn't resist posting a blog about this little pot of goodness, especially as the year has started so slow in regards to birds and bird news for me - due in part to starting a new job and the incessant weather of course. So when Mrs B returned from a night out with the girlies to one of our favourite local restaurants Eat 17 (if you've not been, it's well worth a visit) with a small jar of east London's most delicious relish - Bacon Jam, but now with a twist - I was made up! 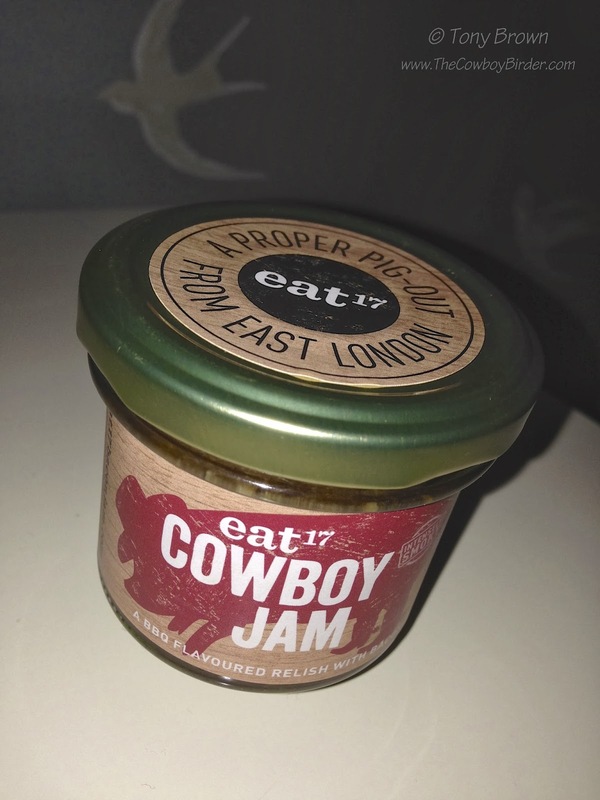 This little piece of heaven has been made even more hip and is now available as BBQ flavoured 'Cowboy Jam' - that's a big yeehaa from me! And as the label says "Saddle up and dig in, partner"- don't you worry I will, especially as the weekend forecast is for more wet and windy weather, giving me a great excuse to have a lay-in. When I eventually rise from my pit - I'll put on a fresh pot of coffee, toast some bread, butter and spread a thick layer of the Cowboy Jam all over, stack a couple of grilled sausages on top, add on a soft fried egg and then lightly salt and devour as the runny yolk drips between the sausages and onto the jammy toast - delicious.